Join us for our monthly Chamber Referral Breakfast! Our October breakfast will be hosted by Financial Advisor, Jennifer Gray at Ameriprise Financial, 48 Mount Vernon Street, Suite 300 in Winchester. Jennifer helps her clients plan well for today and the future through an exclusive Confident Retirement® approach. It starts with a personalized conversation about covering essentials, ensuring lifestyle, preparing for the unexpected and leaving a legacy. 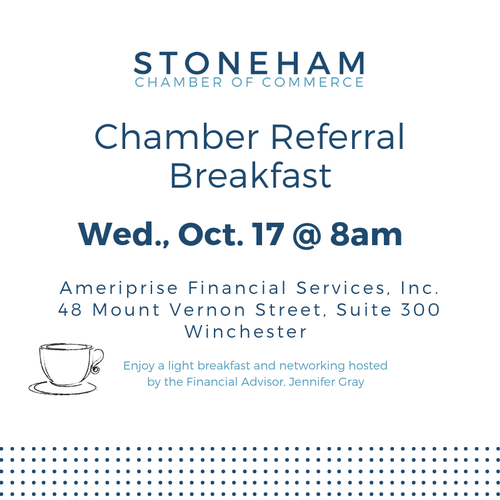 Chamber Referral Breakfasts are held every month at a different Stoneham Chamber business. These events are offered at no cost and provide hosting members the opportunity to showcase their business and attending members the opportunity to both introduce their business, as learn about other services being offered in and around Stoneham.